Read pricing, features, and a review for the Lorex 16 Channel Security System with 2K Resolution and HD 1080p Mix (HDIP16106AW). 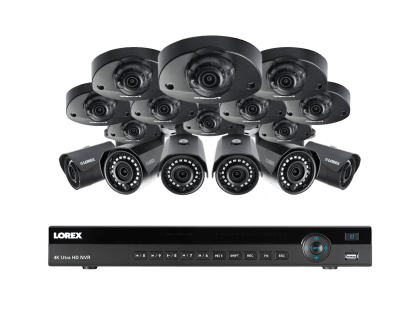 The Lorex 16 Channel Security System with 2K Resolution and HD 1080p Mix is a 2K resolution security system from Lorex. It boasts a night vision range of up to 150 ft. and a 3TB hard drive. 10 audio dome cameras + 6 bullet cameras. 3TB hard drive, expandable up to 8TB. Pros: Easy to set up and has a sturdy build quality. Cons: Cannot change the DVR settings or control most features from the phone app. Bottomline: A reliable camera system with excellent picture quality. What are some alternatives to the Lorex 16 Channel Security System with 2K Resolution and HD 1080p Mix? Where can I buy the Lorex 16 Channel Security System with 2K Resolution and HD 1080p Mix? The Lorex 16 Channel Security System with 2K Resolution and HD 1080p Mix is available on Amazon and on the Lorex website. Does the Lorex 16 Channel Security System with 2K Resolution and HD 1080p Mix work at night? Yes, the camera has a maximum range of up to 150 ft. at night. Can the Lorex 16 Channel Security System with 2K Resolution and HD 1080p Mix be used in any weather? Yes, the camera has an IP66 weatherproof rating, which means it is suitable for both indoor and outdoor usage.